The Moving Comfort Women's Vixen C/D gives you great support whilst giving stay-dry comfort. The back is DriLayer Powermesh designed to give you added breathability and support and has odour control too, with DriLayer Buzz. 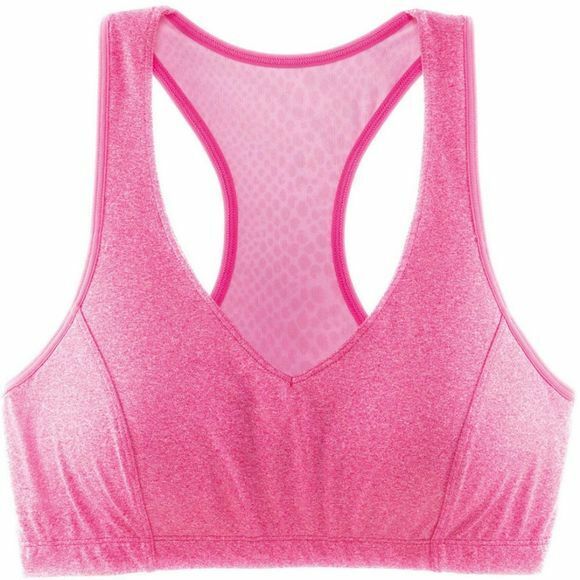 This smooth, stretchy, lightweight fabric gives shapes to Moving Comforts bras, rapidly pulling away moisture from the body and providing a cooling sensation with every wear. As beautiful as it is powerful, you'll find Moving Comforts lightweight mesh strategically placed on both apparel and bras for added breathability and support. This innovative polyester based fabric is made from recycled coffee grounds, also known as S.Cafe, and provides remarkable moisture management, UV protection, and odour control. You'll find it purposefully placed in Moving Comfort's sports bar cups and key sweat zones, like waistbands and the back of the neck.